Our First (Official) Family Photo Shoot! The excitement of Adoption Day still has our family buzzing and feeling electric! WOW! It’s interesting, because nothing has changed, but EVERYTHING has changed! Now, we’re busy planning sleepovers (since for 3 years she wasn’t allowed to sleep any where that wasn’t a certified foster home), getting passports for family vacations, (my parents are wanting to take us all on a Disney Cruise, and they want to take Mariah and my niece away for a week to Niagara Falls this summer), booking sleep away camp, and transferring all of Mariah’s documentation at all of her respective places. You know, getting adopted seems like it means a lot less time with Mamas and lots more time with everyone else! Hmph! Just a few more things to square away to transition Mariah out of Foster Care and into her Adoptive home. And clearly, since you already know we do Milestone Parties pretty huge, Mariah will be having an “Oh-FISH-ially Forever Family” party which already has preparations under way and has an invite list of approximately 150 people! You know, something light! LOL! A colorful underwater extravaganza with fish and octopi and mermaids GALORE! Should be pretty amazing. I hired a friend of mine to take some photos for us. Jesse Rinka, you have outdone yourself again, friend! Papo paying close attention to the judge AND his bottle. Does this even need a caption!?! If anyone wants to know what my life is like? THIS! In a nutshell! Mama being silly (as usual) to get some laughs and giggles from everyone. Whenever we go out, I can almost guarantee that this is the scene you will likely see. I’m sure you can tell, she’s the princess! With her beloved grandparents. Her relationships with them individualy is so beautiful to watch. It reminds me of the special times I shared with my grandpartents and the special memories I always treasure in my heart. 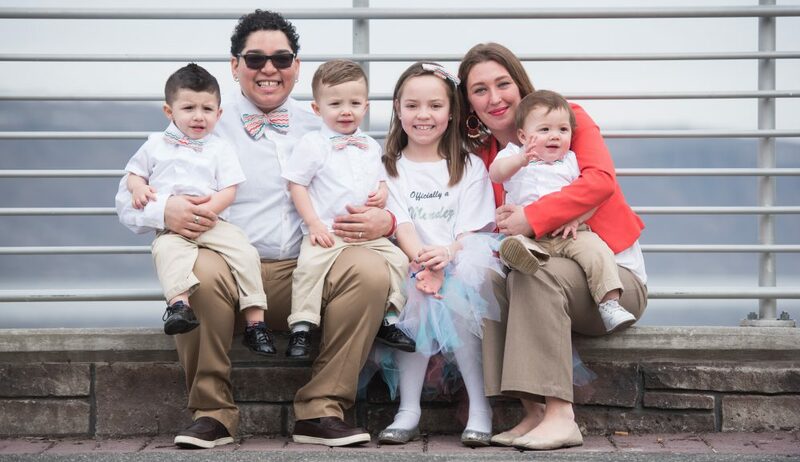 This entry was posted in Uncategorized and tagged Adoption, adoptive family, daughter, foster moms, lgbt family, rainbow family, two moms by Sammie Mendez. Bookmark the permalink. Every single photo is amazing!!! So much love radiating from everyone! Thank you friend…it was so nice looking back at these just a day after. I can imagine what it’ll be like to share these with Mariah’s kids…. Uplifting and inspiring family. All the best. These are incredible. Wow. You can truly feel her joy. All day, the evergy was just….ELECTRIC! That’s the only way to describe it. We’re still kinda on “Adoption day HIgh”…it’s awesome! Thank you, friend…it was such a beautiful special day for all of us. Pure joy! What a beautiful family! This will be you guys soon! I mean, not this HUGE brood, but just as cute! Thank you! So beautiful!! And Mariah is just radiating happiness and comfort. I love your family!! Thanks Amy. You have no idea how much it killed us to want to share so much of Mariah’s joy with everyone! But now the world can see that face, that joy! It’s EVERYTHING, isn’t it?! We love you Mama C, and we miss you dearly! We might be heading to Florida this Sept. if I can get my dad to get in a rented RV with us and head down! LOL! Let’s see how that goes! WE LOVE YOU!!!! Wow. The pure joy in these photos is undeniable and so beautiful. Honestly, the kid looks like you and Christina. It’s incredible. Congrats my friend, such a beautiful family. isn’t it wild!?! She looks like the perfect combination of both of us! It’s crazy! I can’t even with these gorgeous photos of this incredible family. Congratulations!!! So much love! You know, there’s a ton of those pictures, and those are some of my favorites from the bunch. It’s when the Judge was talking to her and saying how excited she was about Mariah finally having a forever home, and sure enough, she was engaged in conversation, and it was so, so clear and evident that she was home! I’m a tough broad, but I’m not ashamed to say I’m shedding a lot of joyous tears. Those are the happiest photos I’ve seen in a long time. Thanks sis! We do too! Thank you! It really was just so much fun, and the energy was just so electric! Other people at the park were laughing with us! It was fantastic! Well, the electric energy radiates right through to all of us. Thank you so much. Just tears! We could blame it on my pregnancy hormones or the sheer joy in these photos! What an utter privilege to have been able to follow along on this amazing journey! Thank you, friend. It’s been really beautiful to share this journey with you all, and have people feel what we feel, and see what we see, and cry when we cry. THAT has been the privilege…the connection, the friendships…so ya know, thank YOU! Love to you guys! WOW so very happy for all of you. You are completely right nothing changes and everything changes when they are officially yours. Congrats on your beautiful family!!! wow ! Wonderful photographs..Your post underlines the fact that irrespective of countries & cultures, we all humans are same at heart where family is the top priority.I too tried to sum up how exactly Indian Family Vacations are in one of my write ups https://the-passport-souls.travel.blog/2017/01/19/family-vacations-the-indian-way/..Happy Family Sammie !! Thanks for stopping by and checking out my family! And you’re right! All humans, all beautiful, all special! I’m gonna swing over and check out your site! Looking forward to it! This put a lot of smiles on my face. Congratulations!! !